More info from the Greater Cleveland Peace Officers Memorial Society website: “The Greater Cleveland Peace Officers Memorial Society honors and preserves the memories of peace officers who gave their lives in the performance of service to their communities and the nation; and provides support to the families of fallen officers. 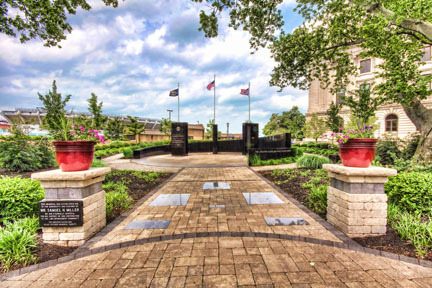 Each May, the Police Memorial Society sponsors the Greater Cleveland Police Memorial Commemoration in conjunction with National Police Week and Peace Officers Memorial Day (May 15th). Public events include a parade down Lakeside Avenue (“Police Memorial Way”) followed by a commemorative service at the Peace Officers Memorial. died in the line of duty. development such as the Pete Lawer Memorial Scholarship fund.